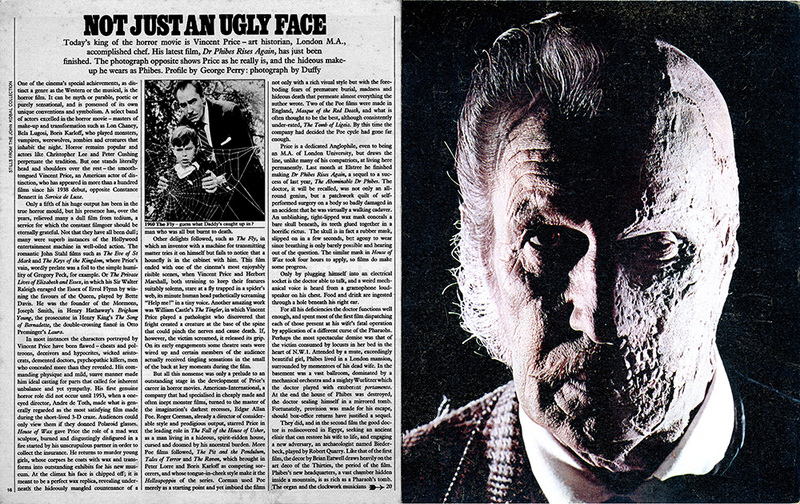 This Sunday Times profile written by George Perry on Vincent Price was published March 5th 1972. The article was promotion for the comical horror film “Dr Phibes Rises Again.” From his screen debut in the late 1930’s Vincent Price was a prolific and decorated actor, writer and chef. Known for his unique and distinct voice he is mainly remembered for his work in the horror genre. Duffy shot this image on one piece of film. A roll of film was loaded into the camera and one half of the face was shot normally in high contrast lighting so the other side was in shadow. Next, the roll was rewound and Mr Price went into makeup. Returning a few hours later and the other side of the face was shot. Of all the photographs taken only one frame on the roll lined up perfectly. Again reflecting Duffy’s risky approach to photography. Today this could be a easily created in photoshop but the technology did not exist in 1972. Duffy often worked with George Perry and they travelled all over the world together during their time working for The Sunday Times Magazine together. Most notably on the set of the film “The Man Who Fell To Earth” featuring David Bowie.